Hope you're enjoying a fabulous and relaxing weekend! This is perfect!! Really love it!! You look so pretty Jacy, I love the olive skinnies and I want one so badly. That's next on my shopping list. I need a pair of olive pants- they just scream "fall" to me! That's definitely a perk! Wish I lived over there so I could have snared a bag or two :( BTW those skinnies are seriously gorgeous! I love you casual yet chic fall outfit Jacy! I love fall outfits like this! I just wish i wasn't 100 degrees still. Mental note - I need more colored skinny! You look chic, Jacy! I would love a pair of olive pants for fall–the cut on these is perfect! Lucky find on that bag! (jealous). That sweater looks like absolute perfection for fall and for only $14?!?! 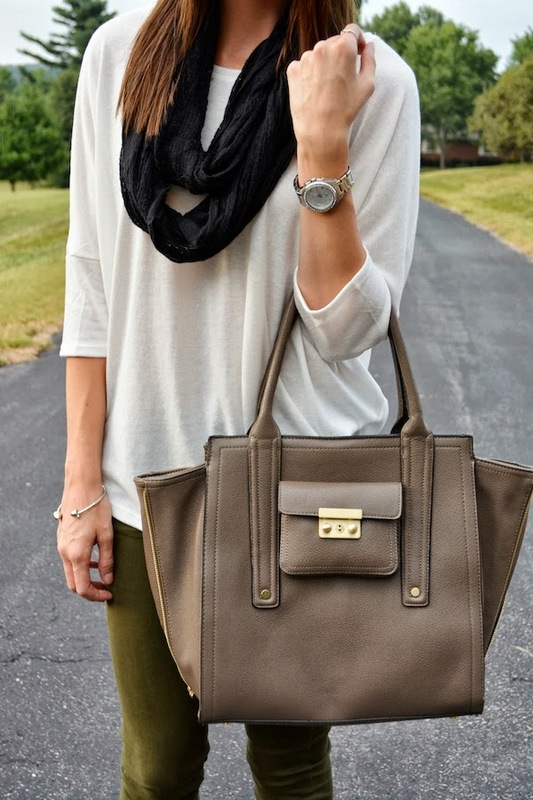 i LOOVE the bag (i got that one too) and i LOOOVE those olive skinnies! the color is sooo pretty! I love the color of your skinny jeans and I love that bag! Loving the booties you're wearing here! That olive color is so perfect for fall- I'm loving your outfit! Love the bag in that color!